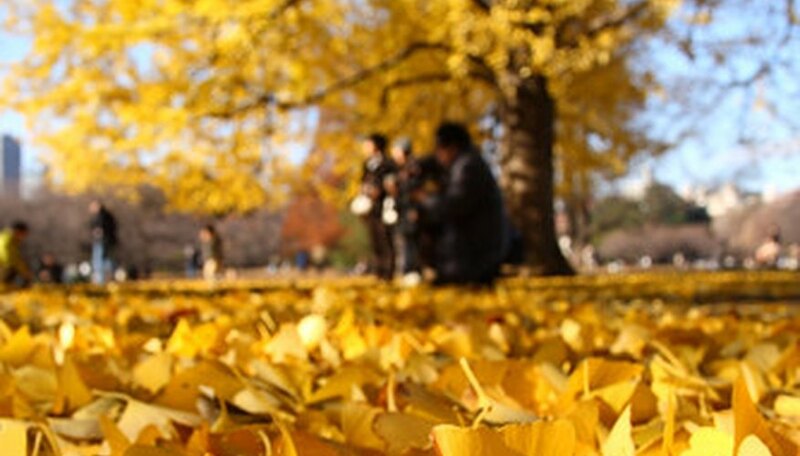 Perhaps one of the first trees with 'funny' leaves you learned about in elementary school, the ginkgo is unique in many ways. Existing at the time of the dinosaurs and able to survive for centuries, ginkgo today is loved as an attractive street and shade tree. Male non-fruiting trees are preferred in the garden, as anyone who has encountered a female tree with dropped fruits will never forget the experience. The gingko tree (Ginkgo biloba) is the only plant species in the family Ginkgoaceae. Ginkgo is a gymosperm, or non-flowering plant, making it a closer relative to conifers and cycads than to flowering trees like oaks and maples. Fossil records reveal the existence of this tree at the time of the dinosaurs. Botanists agree that the ginkgo is native to China, in the remote mountain valleys of the Zhejiang province. Uncertainty exists whether or not the tree still grows naturally there in the wild today. Ginkgo is a large deciduous tree that will reach mature heights of 40 to 80 feet and canopy width of 30 to 40 feet. The tree's shape is conelike in youth and attains more of an irregular, rounded dimension with spreading branches with considerable age. The ridged bark is smooth and gray when young and becomes ridged and brown. The leaves of ginkgo are unique: triangular fan-shaped with a central notch on the middle of the leaf blade. They occur in tufts atop short spurs on the branches. Leaves are bright to medium green and turn golden yellow in autumn before falling off by winter. Ginkgo is a dioecious plant species: each tree is either male or female in gender. Male trees bear cones that look like drooping fingers, called catkins, and shed pollen in mid-spring. Female trees bear naked green ovules on their branches and if pollinated by the wind become fleshy seeds of translucent yellow-orange in autumn, with a stinky flesh. Trees bear fruits only after 15 to 20 years of age. Grow ginkgo in partial to full sun exposures, receiving at least six hours of sunlight daily, in a deep sand-based soil that is moist but well-drained. However, this tree demonstrates remarkable adaptabilities, tolerating all types of soil pH and composition. It also tolerates cold, drought, salt spray, heat, compacted soils and air pollution, making it a popular urban street tree, especially if a non-fruiting male tree is used. It is hardy in USDA zones 3 through 9. Ginkgo trees are primarily used in the temperate and subtropical regions worldwide as an ornamental tree. Rarely are female trees planted in park or residential settings as the smelly fruits are both messy and repulsive. The Chinese traditionally used ginkgo for many medicinal purposes, including improving memory and treating circulatory ailments. Today, the dried green leaves are ground into Ginkgo biloba extract and used to treat Alzheimer's Disease, dementia, tinnitus, retinal disorders, and memory impairments. The flavonoids and terpenoids within the foliage are most beneficial in treating humans, as noted by the University of Maryland Medical Center.